Need a cost-effective pressure boosting solution? Ultraflow UHMS pressure booster units is the answer. Recently, General Pump Company was contacted by a long time distributor who required a pump solution for the large waterfall at Ephraim Island. The waterfall is 30 metres wide and has sea water cascading over four tiers. The existing pump was a surface mounted centrifugal pump coupled to a 22.0kW electric motor. 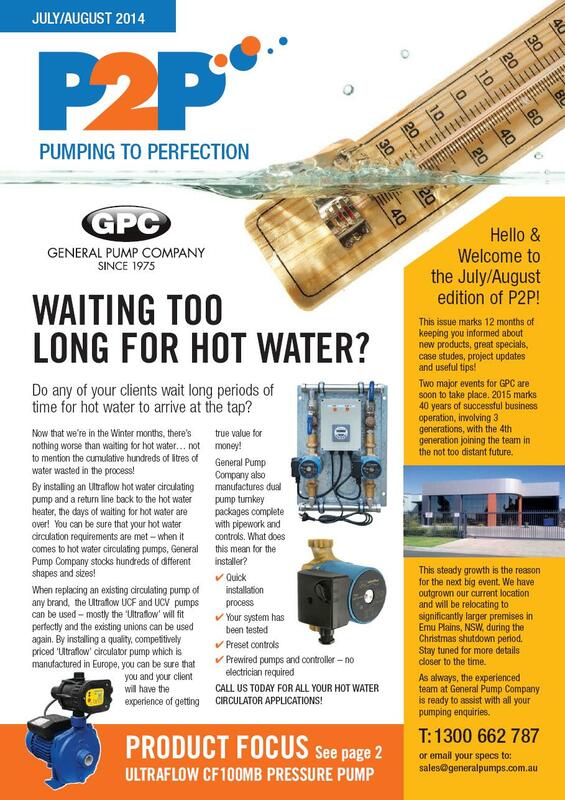 This pump system had been one continuing ‘nightmare’ Read more about this…. In October 2010, Col Clark from Alpha Pumps (one of our long-time distributors in Queensland‚ purchased an ‘ULTRAFLOW’ HDD, Heavy Duty Drainage submersible pump to dewater a large building site. The site had huge flows of seepage entering the basement pits. The pump was operating 24 hours, 7 days a week to keep the seepage water out of the site! Read more about this…. The NSW Rural Fire Brigade have issued a release predicting that the bush fire season will start earlier in a number of areas this year. With forecasts of a drier November, the chances of dangerous and deadly bushfires are high. 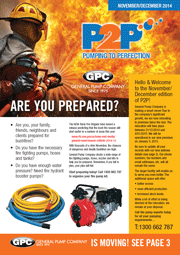 General Pump Company stocks a wide range of fire fighting pumps, hoses, nozzles and kits to help you be prepared. Remember, if you fail to plan, your plan will fail. Enclosures can be fitted with keyed locks for added security. Installation of dual hot water pump systems, mounted inside a weather resistant enclosure is your answer for ensuring your system is protected from the elements and remains covered by warranty. Now that we’re in the Winter months, there’s nothing worse than waiting for hot water… not to mention the cumulative hundreds of litres of water wasted in the process! By installing an Ultraflow hot water circulating pump and a return line back to the hot water heater, the days of waiting for hot water are over! 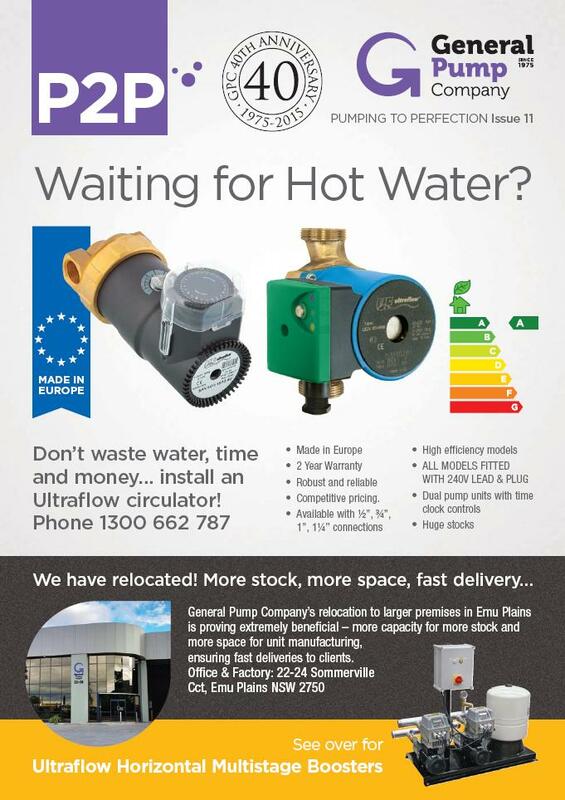 You can be sure that your hot water circulation requirements are met – when it comes to hot water circulating pumps, General Pump Company stocks hundreds of different shapes and sizes! 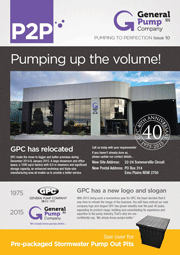 General Pump Company has on offer the quality Ultraflow CF100MBMD pressure pumps. These pumps come with heavy duty, robust cast iron casings, brass impeller and stainless steel shaft. This model is ideal for connecting to an above ground water tank, and servicing 3 -4 taps. These pumps are fitted with an electronic pressure controller that automatically switches the pump on and off and provides ‘dry running’ protection.